The perfect long-lasting gift for gardeners and foodies alike, these great little olive trees will look fab on patios and decks across the country. Their lovely evergreen foliage gives year round interest, and adds a touch of exotic Mediterranean holidays all year. Despite their Mediterranean heritage, olives are surprisingly tough and will happily grow in the UK down to -8C in winters. With its neatly shaped, evergreen grey-green foliage, this Olive is perfect in a border or patio pot or is perfect for framing doorways, entrances and pathways. Supplied as a pair of approx. 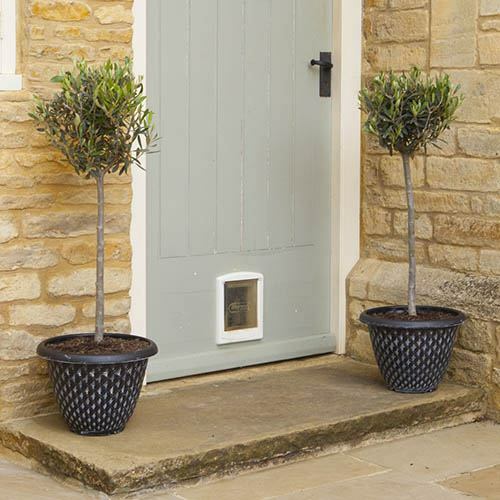 80-90cm tall (inc pot) olive standards with a pair of weather resistant, decorative planters. The perfect long-lasting gift for gardeners and foodies alike, these great little olive trees will look fab on patios and decks across the country. Their lovely evergreen foliage gives year round interest, and adds a touch of exotic Mediterranean holidays all year. Despite their Mediterranean heritage, olives are surprisingly tough and will happily grow in the UK down to -8C in Winters, although it's best if you can protect them a little! Supplied as quality, nursery fresh trees they make a really nice gift to receive - they look perfect framing doorways, gateways, pathways and patios. With its neatly shaped, evergreen grey-green foliage, this Olive is perfect in a border or patio pot and will also look great in a pot in a conservatory. They love hot, sunny spots, thrive in free draining soil and are easy to care for - in a few years in hot summers, you may get a few olives too! With this bundle we’re also including a pair of stunning silver, hand-finished pinecone-effect planters. These weather resistant, plastic planters will add a stunning, contemporary look to your garden and will compliment your Olives beautifully. 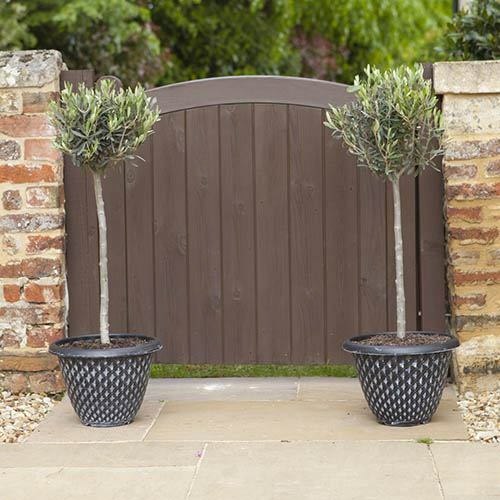 Supplied as a pair of olive trees 80-90cm tall inc pot, grown in lollipop standard form. Also included: Pair of 13” diameter, large, silver, hand finished Pinecone Planters.